Top-seeded Ivan Ljubicic served 18 aces in beating fellow Croat Lovro Zovko 6-4, 7-6 (3) to make the quarterfinals of the Zagreb Indoors on Wednesday. Ljubicic improved to 11-1 in Zagreb after winning the title in 2006 and reaching last year’s final. He’ll play Teimuraz Gabashvili of Russia, who ousted Rik De Voest of South Africa 7-5, 6-1. The other remaining Croat, unseeded Mario Ancic, reached his first quarterfinal in Zagreb when he defeated German Denis Gremelmayr 6-3, 6-2. 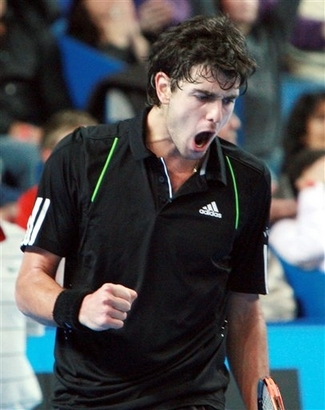 Next up for Ancic, who was runner-up in Marseille on Sunday, will be Robin Haase of the Netherlands. Haase upset No. 3 Gilles Simon of France 6-2, 6-4 for his third quarterfinal of the season. Eighth-seeded Janko Tipsarevic of Serbia beat Croatian wild card Roko Karanusic 6-3, 6-7 (4), 6-4, missing a match point in the second set and needing to come from 4-3 behind in the third. Tipsarevic will play Ukrainian lucky loser Sergiy Stakhovsky after he beat Serbia’s Viktor Troicki 7-6 (7), 3-6, 6-4 for his first quarterfinal in almost three years. Italian Simone Bolelli ousted fifth-seeded Croatian Marin Cilic 6-4, 6-3 to reach his first career quarterfinal, a match with unseeded Olivier Rochus of Belgium, who downed 2006 finalist Stefan Koubek of Austria 6-2, 6-4. Croatia winning 2018 Davis Cup against France - in France! (E) Ivan Ljubicic did it again! (E) Ljubicic Gives Croatia 3-1 Davis Cup Win Over U.S.